All IIPM International students are taught by professors from some of the world’s top 20 B-Schools. These interactions are not merely at a guest lecture level but in some cases at a level where students are taught at least an entire course by faculty members from some of the best business schools across the globe, so that the students get the best possible exposure to world-class teaching. Typically the regular programme students undertake the Advanced Global Management course under these world renowned professors during their GOTA programme in one of the top 20 B-School campuses abroad. The students of the One Year Global Programme additionally get to be taught about twenty percent of the courses by them in India as well.The Global Outreach Programme thus also brings professors of International repute to IIPM in India, enabling these students to be taught by professors from not just one but a majority of the top 20 global B-Schools - thus giving them an exposure which very few B-Schools around the world can boast of giving. Apart from the above, professors from the top 20 B-Schools also take special sessions with IIPM students of multiple branches when they come to India to participate in IIPM’s Academic/ EDP calendar. Though Delhi and Mumbai being corporate hubs remain the favorite EDP destinations in India, in past students of IIPM’s branches in Bangalore, Chennai, Hyderabad, Pune and Ahemedabad have also had the opportunity of being part of such special sessions. 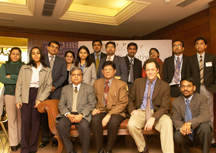 Professors from Harvard University, MIT Sloan School of Management, Columbia GSB, Chicago GSB, Yale School of Management, London Business School, London School of Economics, Kellogg School of Management, Wharton, INSEAD, IMD, Judge School of Business, Stanford, NYU Stern, Said School of Business etc have in past taken classes and EDP’s in IIPM.